The story of Philoctetes, a warrior leader on the Greek expedition to Troy, has long been a favourite of writers and visual artists. Wounded by a snake bite on the journey to Troy, Philoctetes was abandoned on a deserted island by the Greek leaders, because the smell of his wound and his cries of pain prevented the other leaders from carrying out their duties. Years later the Greeks, now at Troy, discovered from a prophet that they needed the arrows of Hercules, which Philoctetes possessed, in order to capture the city. They sent Odysseus and Neoptolemus, the son of Achilles, to fetch the weapons from Philoctetes by force. Sophocles’ treatment of this popular story (a play which won first prize at the drama festival in 409 BC) is, among other things, a famous exploration of the conflict between morally acceptable behaviour and practical expediency. 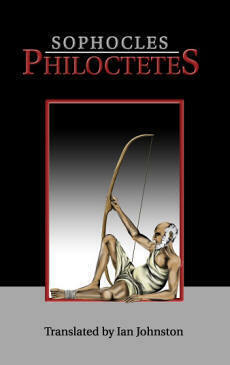 For Neoptolemus, a young man determined to live up to the excellence of his family tradition, is required by the sly Odysseus, his superior officer, to deceive and trick Philoctetes so that the Greeks may take the bow and arrows of Hercules and win victory and fame in Troy, even if that means lying to Philoctetes and leaving him on the island without the one weapon which has enabled him to survive for ten years. Once Neoptolemus witnesses the immense suffering of Philoctetes and hears his story, he experiences the greatest difficulty in carrying out what the practical realities of the political situation demand. Yet he cannot evade having to make a decision about what to do. Ian Johnston’s new translation of this classic play is an accurate rendition of the Greek in a fluent modern English, immediately accessible to the reader and particularly well suited to dramatic performance.